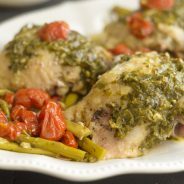 Make a simple but tasty dinner with Instant Pot Pesto Chicken! Place the chicken in the bottom of the Instant Pot. Add the veggies around and on top of the Chicken. Add the chicken broth over the veggies and chicken. Add in the pesto sauce evenly on top. Lock the lid in place and seal the release nozzle. Set to Manual for 25 minutes. Release the nozzle and steam slowly, and then serve.